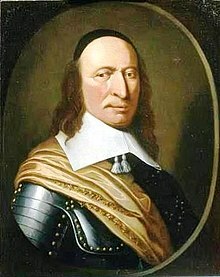 Peter Stuyvesant (c. 1612 – August 1672), served as the last Dutch Director-General of the colony New Netherland (known today as New York City) from 1647 to 1664, when the English took control of the island. He was born in Peperga. He is a major figure in the early history of New York City. In Brooklyn, there are neighborhoods and streets named after him, such as named after him called Stuyvesant Heights and Bedford-Stuyvesant (often shortened to Bedstuy). This page was last changed on 14 September 2017, at 11:02.